Can my restroom be staked down? Can I rent a restroom for 1 day? Weekly service includes pumping of the waste tank, a blue sanitizing recharge, interior sanitation of the walls/urinal and restocking of supplies including two toilet paper rolls and water/soap/paper towels for standard/deluxe units. This is done to keep the units fully stocked, clean and sanitized. We can provide service more frequently if required. How Often Should My Portable Rental Toilet be Serviced? This is highly dependent on the nature of your event , how long it will last, and how many people will be using your portable toilets. 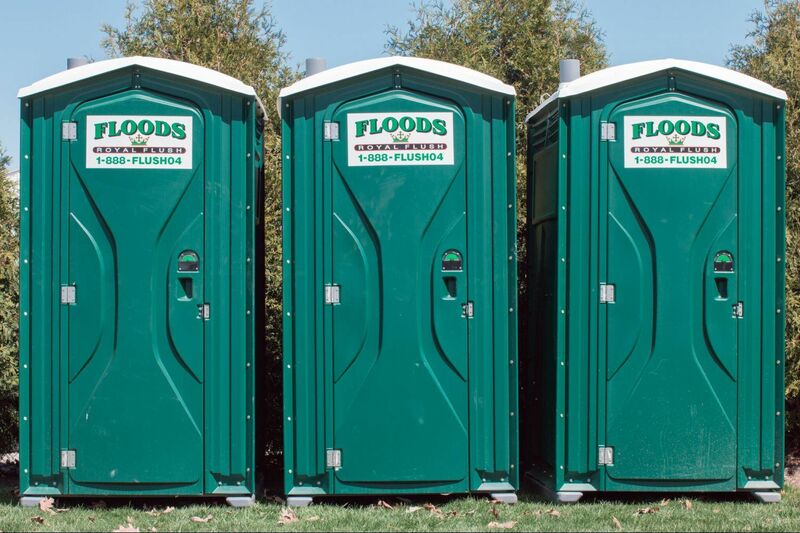 In some cases your portable toilets can be serviced as little as once a week. However, for multi-day events it may be best to have them serviced nightly. The optional damage waiver program protects renters from having to pay expensive replacement costs due to theft, vandalism or accidents. The damage waiver also protects renters from lost or stolen equipment (police report required). To learn more about damage waiver protection please contact our customer service center at 1-888-358-7404. All special event rentals must be prepaid, unless other arrangements have been made with a sales representative. All routed restrooms are billed on a 28-day billing cycle, billing 4 weeks in advance. Each billing cycle you will receive an invoice/statement via email or in the mail showing all company job sites. Where Should I Place My Portable Rental Toilet? While our rental toilets are versatile enough to be placed just about anywhere we do have some recommendations as to where you should place them. Yes! Our Special Event Toilets are reserved only for special events and parties, and have never been at a construction site. To ensure we can service you it is best to make your reservation as far in advance as possible. At a minimum it is best to place your order at least 48 hours in advance. For large special events or job sites, a week or more lead time is advisable. For emergency situations we are able to deliver your toilets the same day. Where does the waste go after it has been pumped? The waste water is taken to local waste water facilities and disposed of according to the regulations, set fourth by the state of Illinois. Most city ordinances specifically spell out the requirements of a portable toilet on a construction site and inspectors will require that a portable toilet is ordered and either placed on site or on its way before approving the inspection. In addition, OSHA requires a portable toilet on a construction site under the Safety and Health Regulations for a Construction (1923.51 (c) (1), 1926.51 (c) (3), (I), (ii), (iii), (iv) ). For information regarding specific city or county ordinances contact the city where construction is occurring. I am planning a weekend festival. When will my restrooms be delivered? FLOODS ROYAL FLUSH not only pumps out the holding tank and cleans the inner bowl of the unit but also provides meticulous janitorial service both inside and out. Our employees clean and sanitize the portable restrooms at each service which includes washing with soap and water. We also provide a special detergent in the water, which acts not only as a sanitizer but deodorizer as well to keep the unit smelling great while reducing exposure to germs. Can I meet the driver to show where to place the units? Yes, upon request, FLOODS ROYAL FLUSH will call an hour in advance of delivery, and the driver will meet you at your designated location. Floods Royal Flush knows that planning and producing successful events is no easy task. That’s why we created a chart to help you.